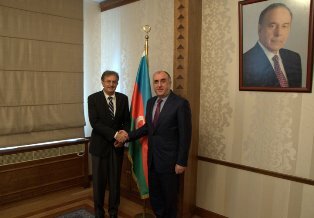 On October 20, 2014 the Minister of foreign issues of Azerbaijan Elmar Mammadyarov received the newly appointed Ambassador of the Republic of Serbia to the Republic of Azerbaijan, Neboysha Rodich. During the meeting Ambassador Neboysha Rodich presented a copy of his credentials to the Minister Elmar Mammadyarov. Minister Elmar Mammadyarov noted that Azerbaijan-Serbia relations are rapidly developing, also wished Rodich success in his diplomatic mission. The Ambassador Rodich said he would spare no efforts to contribute to strengthening traditional friendly ties between Serbia and Azerbaijan.